Sieve parts, sometimes known as shower parts are metal discs with holes punched through so that you can bead in and out of the disc to decorate it with thread or wire. These discs usually form a 2-part finding and accompany a base to which you afix the decorated sieve. 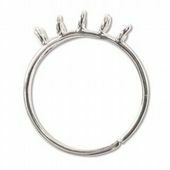 They can be used as rings, pendants, brooches or earrings.